Hey Coffeeholics and accessory junkies! SM Accessories is giving us an advance Christmas treat. 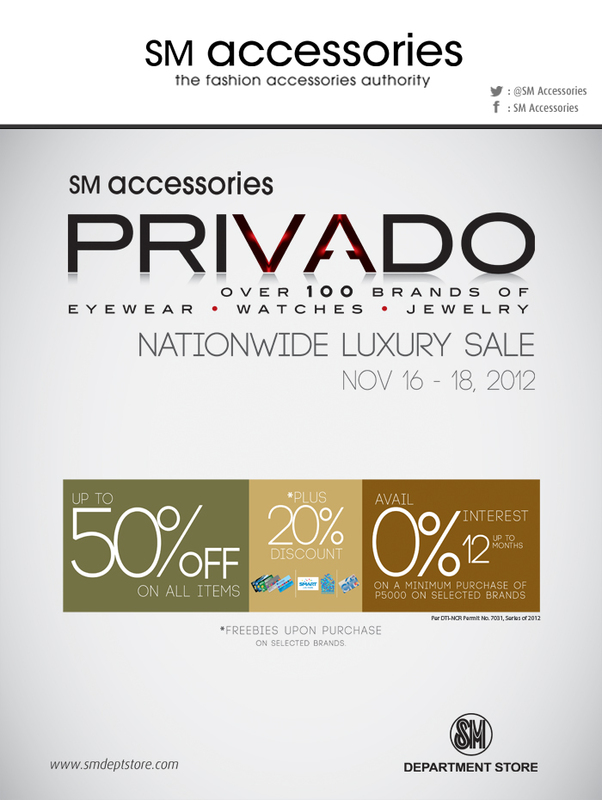 A three-day luxury sale of branded eyewear, watches, and jewelry from November 16 to 18, 2012 in all SM branches NATIONWIDE. Featuring items over 100 hot brands.. Escada, Timex, Roberto Cavalli, Esprit, Police, Tommy Hilfiger, Citizen, Armani, F&C, Kenneth Cole and a lot more! Up to 50% off on these luxury brands, plus 20% discount with your SM Advantage, SM Prestige, or BDO Rewards card or when you are a SMART Rewards member or when you are a Citibank cardholder. See poster for more details. Also check out SM Accessories Facebook page to be updated and in the "know" on what's happening with SM Accessories. Have fun shopping!